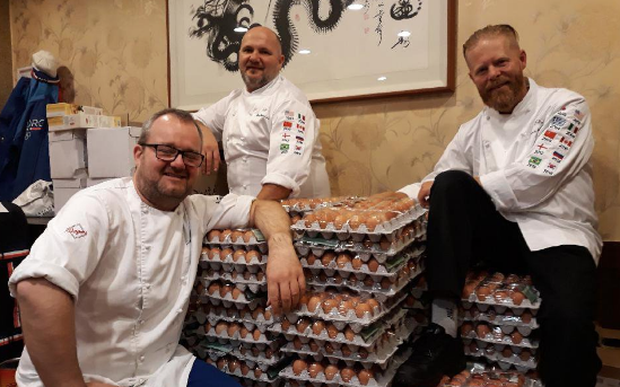 Chefs from Norway's Winter Olympic team accidentally bought 15,000 eggs after attempting to place an order with the help of Google translate. Catering for 109 athletes, Team Norway's cooking staff put in a bulk order from a local shop close to their training base for the upcoming Pyeongchang games. Team head chef chef Stale Johansen said they received "half a truckload of eggs” after trying to place an order for 1,500. "There was literally no end to the delivery," said Johansen. "Absolutely unbelievable." Fortunately the team were allowed to return the 13,500 unwanted eggs. "There will be lots of omelettes, boiled and fried eggs and smoked salmon with scrambled eggs," Johansen told Norway newspaper, Aftenposten. "And we hope there will be a lot of sugar bread made for medal winners. We have made our provisions for that."